This past Thursday, WVDOH had a ribbon cutting ceremony for the completion of the South Branch of the Potomac bridge in Moorefield. At the same time, they had a ground breaking ceremony on a paving project that will ultimately extend Corridor H another 10 plus miles from US 220 in Moorefield to Patterson Creek Road in Forman. The next segment is planned to open in the fall of 2010. In addition, Senator Byrd was able to procure another $4.5 million for Corridor H (along with other projects). He considers Corridor H, "[his] transportation crusade." When this section is completed, its time for WV to apply for numbering of Corridor H as US 48, IMHO. Currently, from west to east, the completed section from I-79 to Elkins is a multiplex of several numbers, but primarally called "US 33" or "Corridor H" by locals. There US 33 continues as a mountain road and when Corridor H resumes it is a complex multiplex of several numbers, with WV 55 being primary. 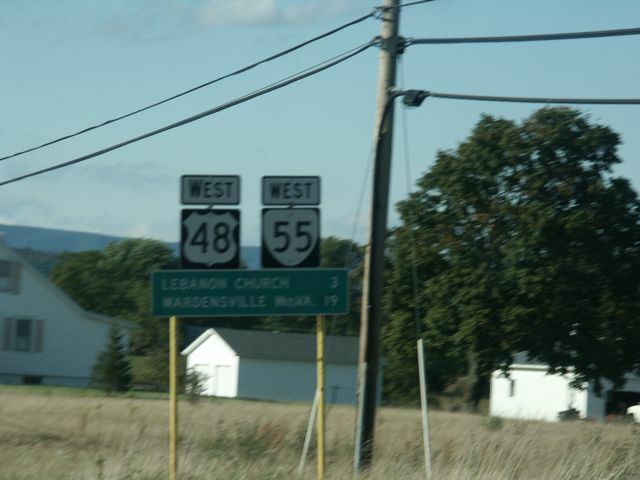 It then ends at Wardensville, and its just WV 55 to the state line. But Virginia has multiplexed US 48 onto the existing VA 55 to I-81. Now, currently, it is very difficult to follow the intended route of Corridor H. It involves following small local routes, including a one lane road in one section over the eastern continental divide. I have done it, but it is not for regular motorists. the route will be the logical travelway through that area, and it would seem to me that US 48 could be applied to all completed sections, from I-79 to Wardensville, and onto WV 55 to the VA line. Then apply "Temp 48" or "Detour 48" or "TO 48" or "WV 48, to US 48" (no AASHTO approval needed for that one) to, from west to east, US 219 from Kerens to Thomas, WV 32 from Thomas to Davis, and WV 93 from Davis to Scheer. For the year it will take to get from Scheer to Forman, US 48 could be bannered on WV 42 and CR 5, which is a good 2 lane road in that point. I've been across WV 42 from Petersburg to Mt. Storm Lake, then WV 93 down to Davis, WV 32 the short distance to Thomas, and US 219 down to Elkins. Did this twice. Drove it from west to east in the summer of 2000, and from east to west during a heavy snowstorm in January 2004. This was the closest approximation I could find to the Corridor H route on major maps. I know the Corridor H routing will run to the north of WV 42 and won't come near Petersburg. So there is a good way to approximate the routing from north of Moorefield (where Corridor H will cross US 220) over to the Mt. Storm Lake area? In a couple of weeks I'll be in the area, but plan to drive the route that is continuously numbered as WV 55 all the way from the state line to Elkins. The worst section will be the US 33 part from Seneca Rocks to Harman. The rest, even the two/lane parts of WV 28/WV 55 and US 220/WV 28/WV 55, are all very good roads for this part of the country, as they pretty much go through valley areas. From the end of the current road, exit onto US 220 NORTH and go about 2 miles. At Old Fields take a left onto CR 2 and follow it for 8 miles. It will change numbers (although CRs are not numbered with "reassurance signs" anyway) to CR 5/2 at the Hardy/Grant line. This will come out on CR 5. Go SOUTH on CR 5 for 4 miles. Then turn onto CR 3/3 which is Greenland Gap Road. Follow this out and you come out in Scherr. Except for about 100 yards right at the beginning CR 2 and CR 5/2 are 2 lanes or a lane and a half. CR 5 is equal in quality to any standard WV state route. CR 3/3 is a lane and a half or two lanes, except for the actual Greenland Gap, which is the eastern continental divide and belongs to the Nature Converancy, which is one lane. It is still a public road. All is paved. This follows the eventual Corridor H almost exactly, especially in Greenland Gap. Except for one bridge, CR 3/3 is still at least 18ft wide through the Greenland Gap/Nature Conservancy area. As for Corridor H, it crosses CR 3/3 near Greenland Gap, but in that area, Corridor H is actually being built north-south, along the north-south leg of Scherr Rd (CR 1), and then south along what was CR 42/3. You can see construction on a high level bridge from the CR 1/CR 3/3 intersection. Between CR 5 and CR 3, the corridor is about halfway between CR 3/3 and CR 3/4...closer to CR 3/3 on the east end, but closer to CR 3/4 on the west end. A couple miles north of Scherr, you can see where the connector to WV 93 is being built. The easiest way to get a major upgrade done to Corridor H and show considerable progress is to twin WV 93. Except for the portion around the lake, there appears to be ample ROW to add two lanes since the whole route passes through what appears to be a reclaimed surface mine. It would seem to me that the rest of Corridor H, which is unfunded (the red and yellow parts on this map http://www.wvcorridorh.com/route/lrgmap.html ) would be an easy toll road. The vast majority of traffic on that section is not going to be daily commuters who are the people disadvantaged by toll roads. They are going to be people out of Huntington-Charleston or out of state going to the ski resorts, or people using the road as a throughway to and from the DC metro (if you look at a map, a completed H is a good way into DC from much of the midwest and upper south). So you eliminate at grades and start a fully limited road at Kerens, with an exit for WV 72, one for US 219 and WV 32, one at Bismarck and end at Scheer. This would get H finished in whatever amount of time the construction takes (other than the section from Wardensville to the VA line for which funding can be found, and the VA sections, which is a tempest in a teapot, VA will build it). Was Corridor H originally supposed to go to Cincinnati? I found this editorial in the Charleston Gazette that reads. However, one impediment remains. East-west Corridor H from Weston to the Virginia border is only half-finished -- after 40 years of work. The freeway intended to link Cincinnati and the nation's capital still is interrupted by stretches of old-style two-lane torment. I'm glad to hear about Corridor H- on my revamping of the interstate system in If You Controlled the Highway System , I felt I-74 or I-66 could be extended through West Virginia for a route to Cincinnati , Columbus, and Richmond. What's this obsession about US 48? Should US 48 reappear because I-68 took its place. We might as have the AASHTO take over a bunch of state and county roads and call it US 66. We might as have the AASHTO take over a bunch of state and county roads and call it US 66. AASHTO doesn't "take over" roads. All Interstate and U.S. routes are maintained by the states. AASHTO is merely the Keeper of the Numbers. They don't even provide Interstate funding (that's FHWA's job). AASHTO also provides the specifications for signage. At least, the 1958 interstate signing manual I have here is courtesy of AASHO (which is what AASHTO was known as back then). No. The western end of H always was intended to be Elkins. However that is MP 99 of I-79. From there a motorist could go 20 miles north to MP 119 - Clarksburg, the eastern end of Corridor D, which as US 50 and then OH 32, reach Cincinnati. If you project a completed G, H, and D on the map, you see major changes in many links between the lower midwest and upper south and the DC metro area. This posting is coming to you from Weston, western end of Corridor H, where I spent the night last night. I drove part of the Corridor H route yesterday on my way back from New York. I took VA 55/US 48 from I-81 west to Wardensville. Around 20 miles, took about 25 minutes, not a bad road at all. (Randy Hersh's head will explode at that news and when he sees the video I shot). You have to drive through Wardensville and then there's access to the new four-lane, which is a fast and scenic drive over to Moorefield. All traffic is forced off the four-lane at what I call a West Virginia diamond (examples are US 119 at WV 73 in Logan and I-64 at former US 35/current WV 817 west of Charleston) and onto a connector route that leads down to US 220, although the completed bridge over the South Branch of the Potomac can be seen in the distance. From there I deviated from the route Corridor H is supposed to follow and took WV 55/WV 28 south to Seneca Rocks. This is a very good road, mostly flat and straight, although it could use resurfacing in several places), and the worst part of the trip is US 33, where you cross three mountains before you get to the "racetrack" four-lane section east of Elkins. Traffic alway moves slowly through Elkins, that town needs a downtown bypass, but I followed US 33 out to Corridor H and over to Weston, where I decided to stop for the night. I'll have to check my mileage on my odometer, as I filled up in Strasburg and reset it, but the mileage should be around 175 between I-81 and I-79. Time was a little less than three hours. Traffic was light on the two-lanes and there were no slow trucks to have to follow across the US 33 mountain crossings. Even as is, it's a pleasant and scenic alternative to going all the way north to I-68. When completed it will be a much more direct route from Charleston, Huntington, Lexington, Louisville, Cincinnati, and even Evansville and St. Louis to the DC area than any combination of I-70 or I-68 through Maryland and Pennsylvania. These days signage specifications are found in the MUTCD and the Standard Highway Signs (SHS) books, both of which are FHWA/USDOT publications. If I remember correctly, AASHO did a lot of the legwork in getting all states on the same page with regard to color and shape standards in the early part of the 20th Century. When Chief MacDonald took over at BPR (the predecessor to FHWA), it started having a more and more active role in things. Slightly related to Corridor H is the US 220 North/South Corridor Proposal from I-68 in Cumberland, MD to Corridor H in Moorefield, WV. Has US-48 been signed anywhere (and not just in WVA)? It has only been signed in VA along VA-55 from I-81 to the West Virginia boarder. Re: US-48: VA: Yes, WV: No? 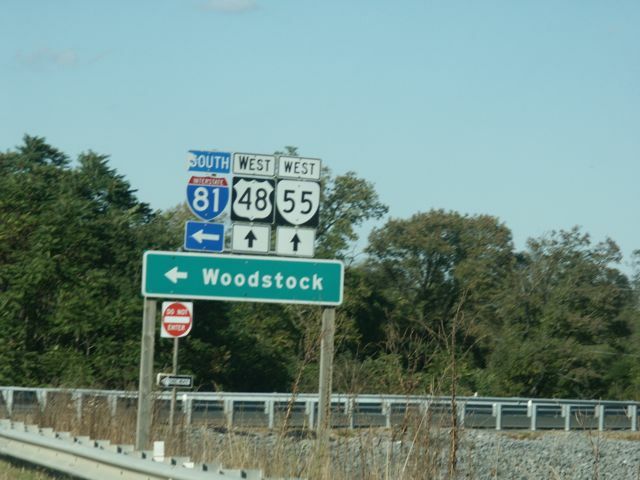 So US-48 has been signed as such in Virginia but not in West Virginia as of now? Oh it's been signed in Virginia for over six years if not more now...where have you been, HighwayMaster? After some hiking in Maryland on Sunday (to the highest point in Maryland, amongst other places), I headed home via the Corridor H area. Posted an update on the blog, but in a nutshell, there's more grading/bridgework being done between Scherr and Forman, the interchange at CR 5 in Forman will be a folded diamond, and paving between Forman and Moorefield will mostly be concrete. That explains the snow... something that hopefully I'll be seeing quite a bit of when I head to NYC & LI in December. speaking of 48, anyone have a photo of a Maryland US 48 shield? The snow is the reason I traveled that route on that trip. I was coming home from a business trip to Washington DC and intended to drive I-81 to I-64 on the way home (going up I took I-79 to I-68). However it started to snow as I neared the end of I-66 and it was starting to stick on the road when I hit I-81. I do not like to drive on snowy interstates, especially ones as busy as I-81, because the trucks don't slow down to an appropriate speed. I'd rather drive a snow-covered two-lane mountain road than an interstate with a light accumulation because I don't trust other drivers. So I opted for the Corridor H route of VA/WV 55, WV 42, WV 93 and US 219 to meet up with US 33. At the time the only portion of the eastern four-lane was between the WV 259 exit and the East Moorefield exit, and there was no traffic on it. It worked out well, I ran out of the snow by the time I got to I-79 and it was smooth sailing on home.